A registered Canadian charity is authorized by the Income Tax Act (ITA) to issue charitable tax receipts to donors for gifts received. Donors, in turn, are generally permitted by the ITA to claim a credit or deduction for each gift to reduce the amount of income tax they have to pay. Donors need the charitable tax receipts (referred to as “receipts”) as proof that they actually made a gift. Not everything that a charity receives qualifies as a gift for tax purposes. It’s a charity’s responsibility to know what qualifies as a gift for tax purposes; how much of a gift can be receipted; and how to issue receipts. 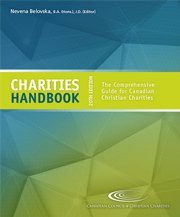 59: Online charitable donations and transaction fees: what can be receipted? "An eligible person that donates agricultural products to eligible community food programs in Ontario, including food banks, may be able to claim a tax credit, in addition to the charitable donation tax credit."